As a graduate student at the Eastman School of Music, my circle of friends included many composers, particularly my roommate and dear friend, Maria Grenfell. I loved learning about new repertoire and composers from their vast knowledge of new music, and I especially loved watching and occasionally being part of the process of creating new works. Often, when these friends needed flutists to perform their works I would enthusiastically oblige. These were the few moments when I would also have contact with our stellar faculty, which included Joseph Schwantner, Christopher Rouse, Samuel Adler, and Augusta Read Thomas. Since leaving Eastman, I continued to follow the professional pursuits of these wonderful friends and faculty members with great curiosity. When I heard about Joseph Schwantner’s flute quartet, Silver Halo, I wanted to find a copy right away. I asked a friend, Ellen Huntington, who was headed to the National Flute Association annual convention that summer, if she could pick up a copy for me. As it turned out, it wasn’t available at the time, but she thoughtfully brought back a signed copy of Joseph Schwantner’s Looking Back for flute and piano. I looked through the pages at the intricate rhythms and inspired writing, and I felt determined to perform it someday. Soon afterwards, I heard that Mary Stolper had acquired a copy of Silver Halo, and so I contacted her to see where I could pick up a score. She directed me to Sherry and Walfrid Kujala, my teacher from undergrad at Northwestern, who had been friends with Schwantner for many years. With their guidance, I found and eagerly purchased a score, and assigned it to a particularly strong and bright group of flutists who were studying at Wheaton College Conservatory with me at that time. Together, we worked on the score for about a year, daunting as it was, with much success. The next year, Sherry and Wally contacted me to let me know that Joseph Schwantner would be coming to Chicago and asked if I might like to sit in on the class he would teach at Northwestern. Of course, I jumped at the opportunity and asked permission to bring my students who had been studying Silver Halo. 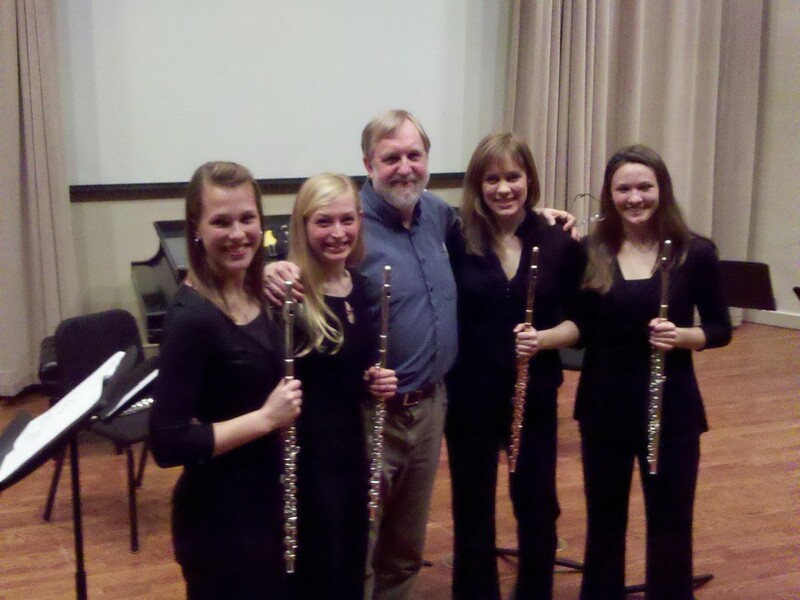 When they asked Schwantner if I could bring these students, he recalled my support of my composer friends back at Eastman, and offered to meet with my students himself together with a graduate flute quartet from Northwestern! I couldn’t have been more thrilled. This generosity truly touched my heart, and marked the beginning of many such interactions in coming years. I spoke to Schwantner about the possibility of recording his complete flute works, and he happily supported the idea. I was also excited to have wonderful friends involved. 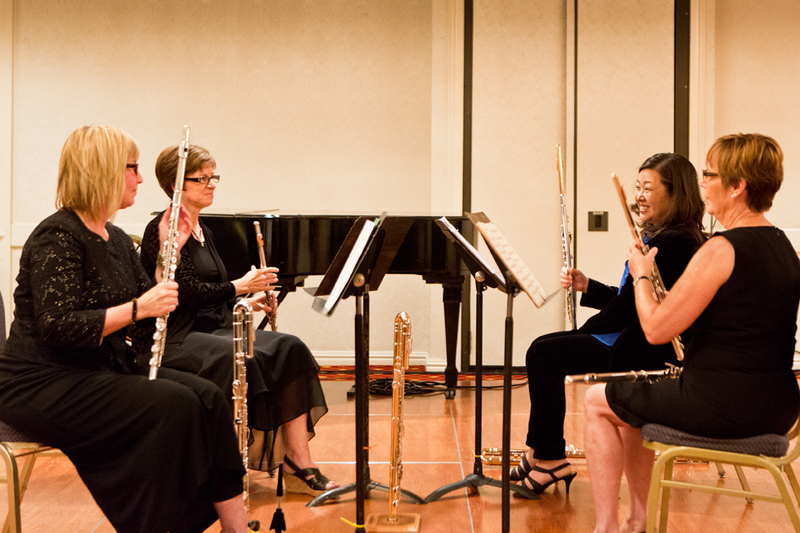 Karin Ursin (piccolo/flute), Janice MacDonald (alto/flute), Susan Saylor (bass/flute), and Jeff Panko (piano), are all among the most accomplished and highly regarded musicians in the Chicago area. Without question, these pieces were all formidable both technically and rhythmically, but they were artistically so intriguing. What I found most challenging, as we worked through each one, was Schwantner’s use of dynamics, particularly in his flute and piano pieces. Every last marking created a stunningly unique and unexpected sound, a new virtuosity of color and texture. Although Silver Halo came together relatively quickly, Looking Back took considerably more careful thought. We wanted to capture every last nuance in a way that was natural and beautiful, despite the excruciatingly virtuosic writing. In the end, we created a recording that speaks to our interpretation of these pieces, with outstanding context and history of the pieces provided by Temple University Professor Cynthia Folio as well as beautiful cover artwork by my sister, graphic designer Caroline Oh. Additionally, I am especially honored to have the support of Innova Recordings and the American Composers Forum. I’ve had the opportunity to perform both Silver Halo and Looking Back at the National Flute Association Annual Conventions in both San Diego and Chicago, I’ve performed Looking Back at the Eastman School of Music, and I’ve performed Black Anemones and Looking Back at the Chicago Flute Club’s 25th Anniversary Celebration concert. Most importantly, I programmed Looking Back on the inaugural concerts for my chamber ensemble, Picosa. Next month, I will be launching my album in three performances. On November 9th, I will be presenting Black Anemones and Looking Back on WFMT with highly esteemed pianist Kuang Hao Huang in a program of works by Chicago composers with Mary Stolper and friends. On November 5th at Mayslake Peabody Estate (Oak Brook) and 14th at Gottlieb Hall (Chicago), I will be celebrating the launch of this wonderful album together with my chamber ensemble, Picosa. The program of the Picosa concerts creates a beautiful framework to showcase the works of the album. 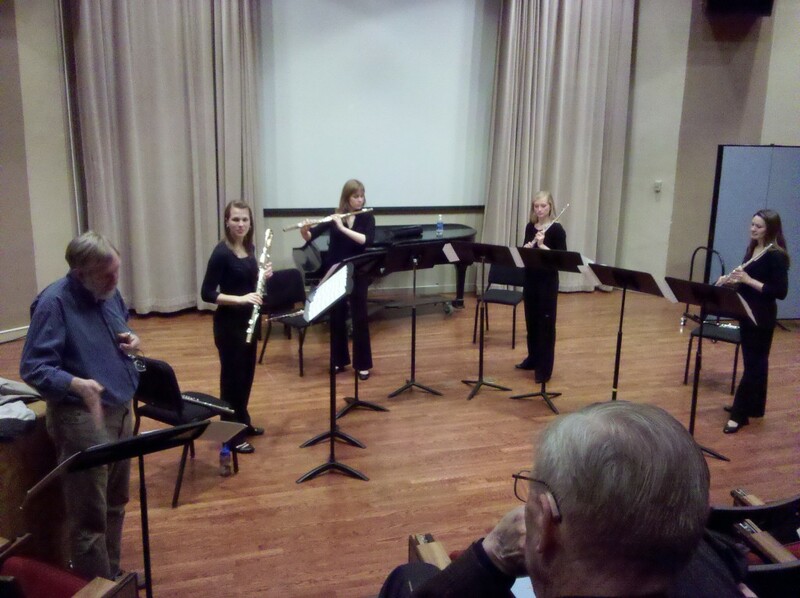 One of Schwantner’s earliest works, Consortium I (1970), will be performed alongside Taking Charge (2013), his most recent work involving the flute. Taking Charge was commissioned in celebration of Walfrid Kujala’s retirement from Northwestern University and consequently has a very dear place in my heart, not only because I am especially grateful to have been a part of Kujala’s illustrious teaching career, but also because my students and I were so privileged to be a part of Schwantner’s early visits to Northwestern at the beginning of this commissioning process. 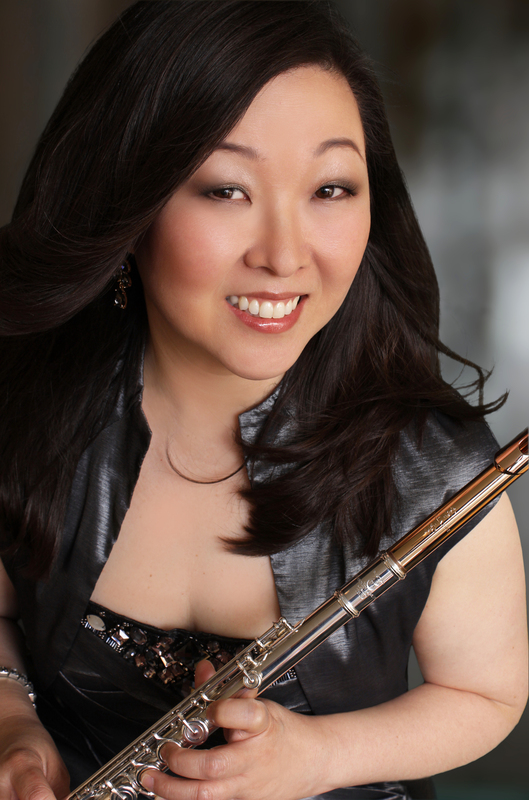 Additional repertoire in the Picosa program spans the centuries with works by Dvorak, Stravinsky, Chicago composer Stacy Garrop, and 2013 Pulitzer Prize winner Caroline Shaw. Nicholas Jeffery (viola) will perform with us on Consortium I, Jani Parsons (piano) will perform with us on Little Bits, and Peter Ferry and Chris Sies (percussion) will perform with us Taking Charge. I hope you’ll join us, too! Tickets are $25 for adults, with discounts for students and seniors. Click here for more information. 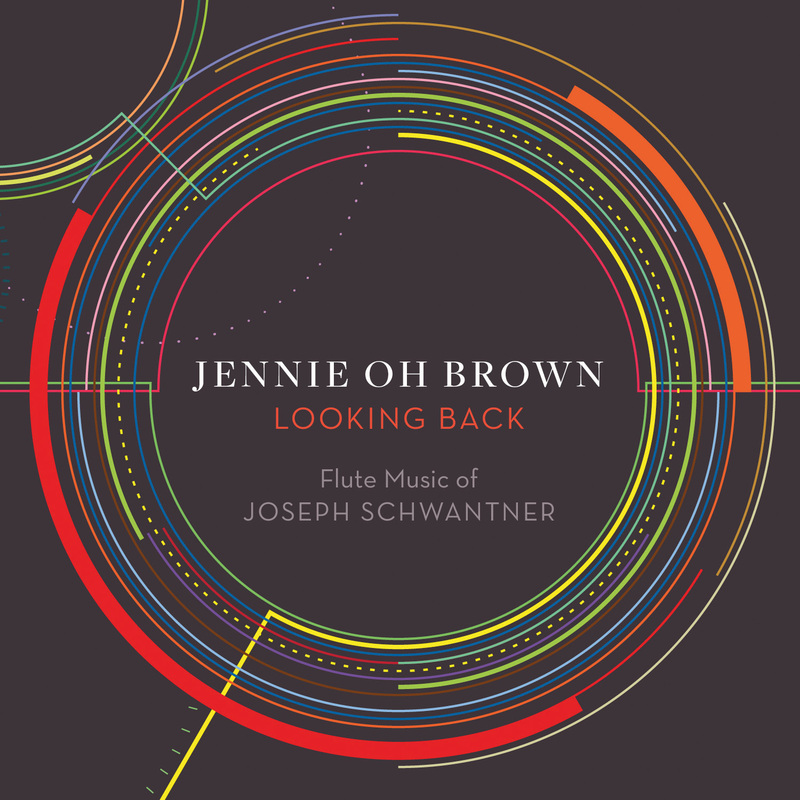 You can find my album Looking Back: Flute Music of Joseph Schwantner on Innova Recordings, iTunes, and Amazon. Great descriptions, narrative, photos, and concert info!